A QUT scholarship to support outstanding PhD students in the field of digital media and communication was announced at a major research conference in Brisbane. The John Hartley Oxford Institute Summer Doctoral Programme Scholarship was announced by Executive Dean of the Creative Industries Faculty Mandy Thomas at the International Communication Association's Regional Conference in Brisbane. The scholarship has been made possible by a generous personal gift from the Creative Industries Faculty's founding Dean, Professor John Hartley. It will support outstanding PhD students in the field of digital media and communication to attend the prestigious Oxford Internet Institute's (OII) Summer Doctoral Programme. One scholarship will be awarded each year for the next 5-6 years, with matched funding from the Faculty enabling two scholarships to be offered each year. In years where there are one or more successful CIF applicants to the Programme, the scholarships will be awarded to those students most highly ranked in the OII's own highly competitive selection process. Preference will be given to international, Indigenous and female students for the John Hartley scholarship. "I am delighted that we have been able to announce this new initiative and very grateful for Professor Hartley's ongoing support of digital media research at QUT," Director of Research Training Associate Professor Jean Burgess said. "The scholarship represents a wonderful alignment between the OII's research agenda and John's pioneering work in the area of digital society and culture, as well as the strong institutional relationship the Creative Industries Faculty has built with the OII SDP over the past decade, sending at least one if not more than one of our most promising PhD students in digital media, communication and cultural studies to the program each year since it began in 2003." It was under Distinguished Professor Hartley's leadership as Foundation Dean of the Creative Industries Faculty that QUT's relationship with the OII was established. 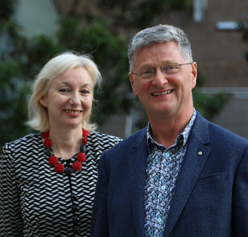 Professor Hartley is now John Curtin Distinguished Professor and Director of the Centre of Culture and Technology at Curtin University and Professor of Journalism, Media and Cultural Studies at Cardiff University. For more information about the scholarship, contact Associate Professor Jean Burgess.